KFC is running out of chicken across the U.K.
LONDON -- KFC is running out of ... chicken? About 800 of the company's roughly 900 locations in Britain were closed as of midday on Monday. Some had opened for business by the afternoon, according to the company's website. KFC, which is owned by Taco Bell and Pizza Hut parent Yum!, said the chicken shortage had been caused by a "couple of teething problems" with its new delivery partner, DHL. "We won't compromise on quality, so no deliveries has meant some of our restaurants are closed, and others are operating a limited menu, or shortened hours," KFC said in a statement. DHL acknowledged that a number of its deliveries had been "incomplete or delayed" because of "operational issues." The logistics company said it was working with KFC to solve the problem. KFC switched suppliers from Bidvest Logistics to DHL last Wednesday. Bidvest said that from its perspective, the transition had been "seamless." Franchisees operate 95% of KFC's outlets in the U.K. The company said in a statement that it would pay its staff as normal, and it was encouraging franchisees to do the same. 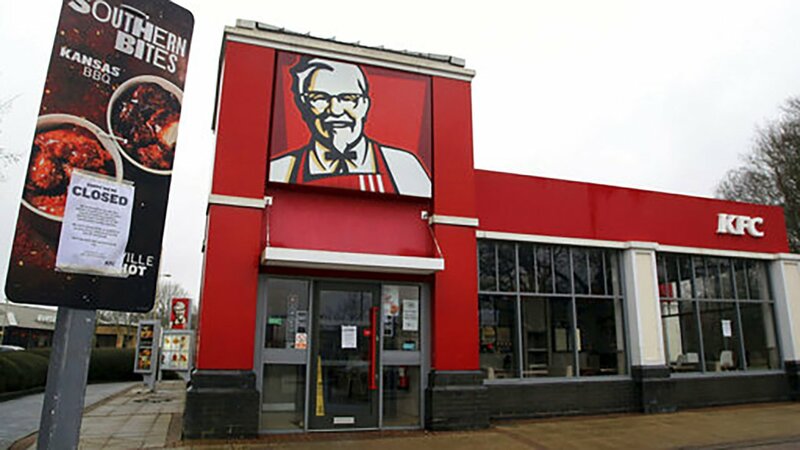 Britain is KFC's largest market in Europe, and one of its top five globally. KFC fans were not happy -- and many used social media to complain and express amusement over a chicken restaurant running out of its signature product.